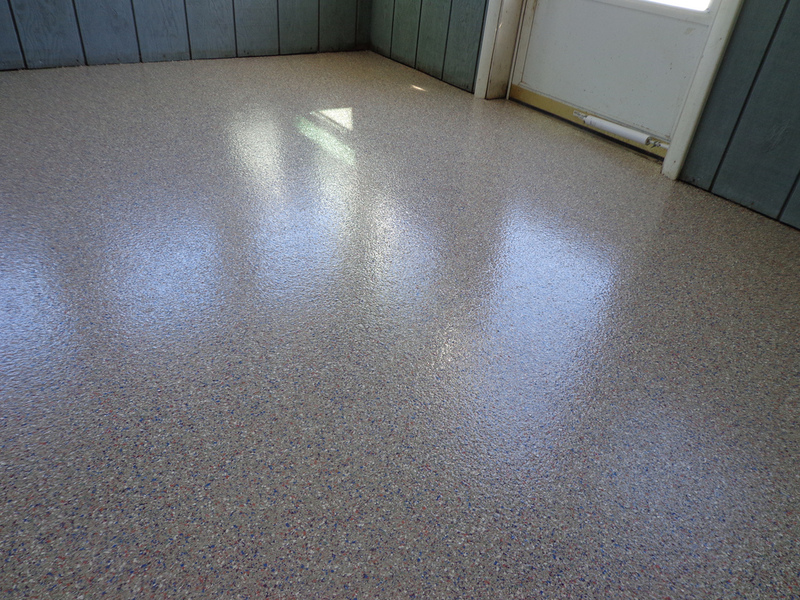 Decorative Epoxy Flakes System is a decorative and extremely durable concrete resurfacing system. 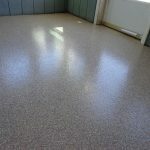 It is used for environments requiring an attractive, aesthetically pleasing, high performance floor. Available in endless colors and patterns to suit any environment. Also known as decorative vinyl color chips, flakes or fleck are specially formulated paint aggregates used to enhance the aesthetic qualities of seamless, resin-based chip/flake flooring systems. This unique product is random in shape, sized within a standardized range and custom blended to match any décor. 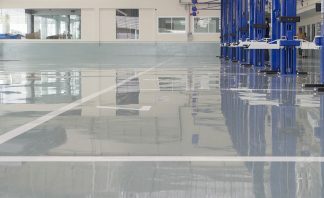 Epoxy Flake floors are continuing to gain popularity amongst architects, designers, contractors and consumers, because of their unique properties that deliver complete customization to commercial, residential and industrial floors with an endless range color-styles, texture, size and blending options. 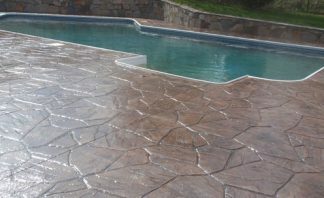 Any exposed porous surface such a concrete, brick or natural stone is susceptible to staining and discoloration. Stains can come from water, oil, organic and food based substances. Our customers expect their masonry to stay clean and pristine and often turn to clear sealers to provide protection and reduce maintenance costs. 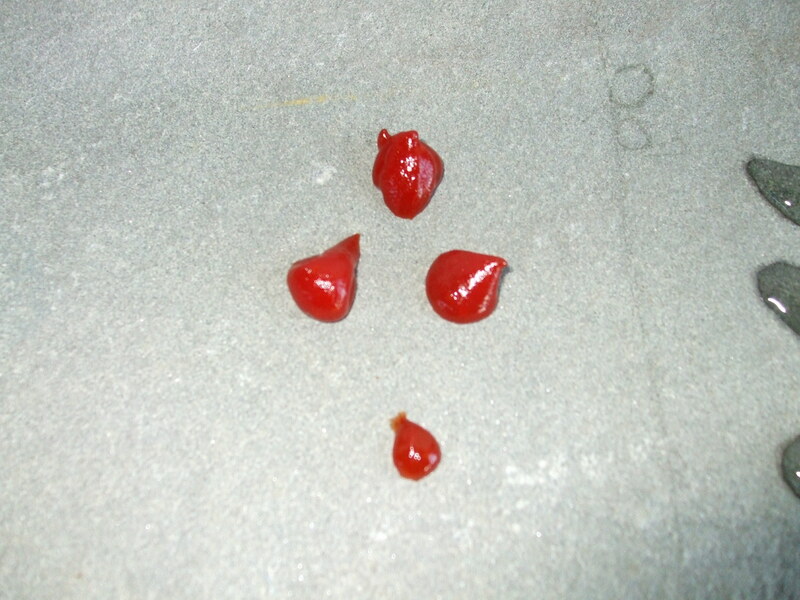 However not all sealers are the same when it comes to oil and staining. Many of the penetrating type sealers are silane /siloxane sealers (silicone based). These penetrating sealers are effective in sealing out water but do not protect against oil based stains from petroleum products or from fat grease found in foods. Acrylic based sealers can offer oil stain protection but are “film forming” and darken the surface and often times have a glossy finish. 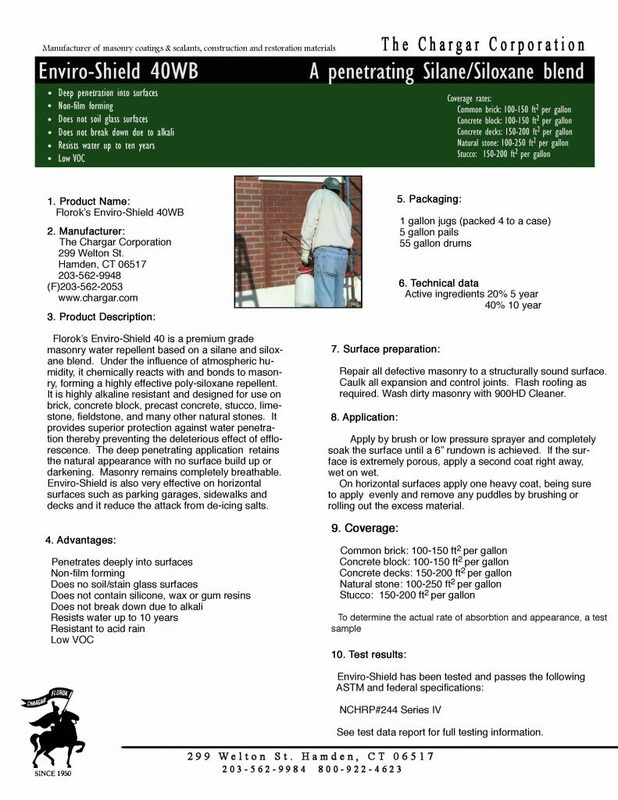 The Chargar Corporation has introduced a new and unique masonry sealer formulated with patented stain blocking resins prevents staining on surfaces as well as water and oil repellency. Ultimate Stain Repellent has unique qualities, doesn’t change the appearance of the surface and is not a film forming type sealer. It resists motor oil, transmission fluids, diesel fuel, wine, ketchup, grease from grilling foods, soft drinks. Many sealers do a great job repelling water and moisture intrusion but fail at blocking the buildup of oil and staining type soils. Ultimate Stain Repellent penetrates into porous materials, creating a long-lasting barrier that “locks-out” oils, water and soil. This barrier forces liquids to bead up on the surface, allowing them to be picked up more easily, and preventing them from causing a stain. The penetrating sealer will not only provide improved chemical and oil resistance, but it will also prevent dusting, spalling and inhibit efflorescence. Blue dye added to water to highlight beading. Ultimate Stain Repellent is a clear penetrating sealer, breathable, non film forming and VOC compliant water based solution. The main benefits of Ultimate Stain Repellent are resistance to automotive fluids, food products such as mustard, mayonnaise, ketchup, wine. Can be used on vertical or horizontal applications. 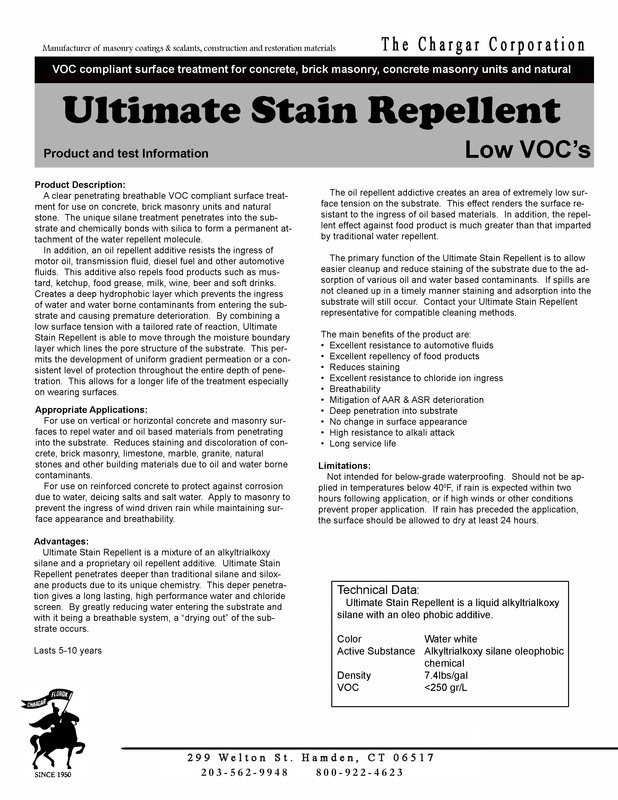 Ultimate Stain Repellent is also an excellent water repellent. De-Icings salts such as rock salt, calcium chloride, magnesium chloride, and other salt related products all do damage to concrete surfaces. The resulting slurry of melted ice and salt is absorbed into the concrete causing spalling and general erosion of the surface. 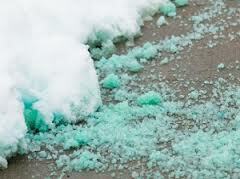 Salt Block WB does not allow the salty slurry created by the de-icing salt from soaking into the concrete and destroying your concrete surface. A chemical reaction occurs within the pores of the concrete creating an invisible barrier which prevents absorption into the surface. 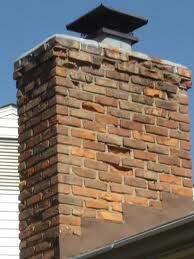 A treatment of Salt Block will save you hundreds of dollars in future concrete repairs. 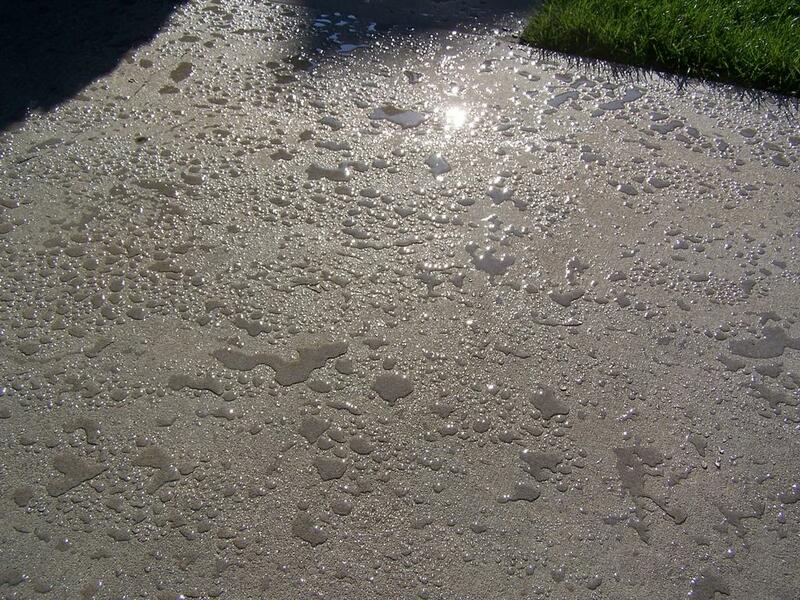 Concrete that has pitted and spalled needs to be repaired using a concrete repair mortar such as Plas-Tex Powder. 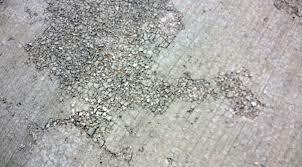 All broken and loose concrete needs to be removed prior to patching to ensure the patch gets a strong, permanent bond. Once all patching has been completed and allowed to cure the surface can now be sealed with Salt Block WB to protect and prevent future damage from de-icing salts. 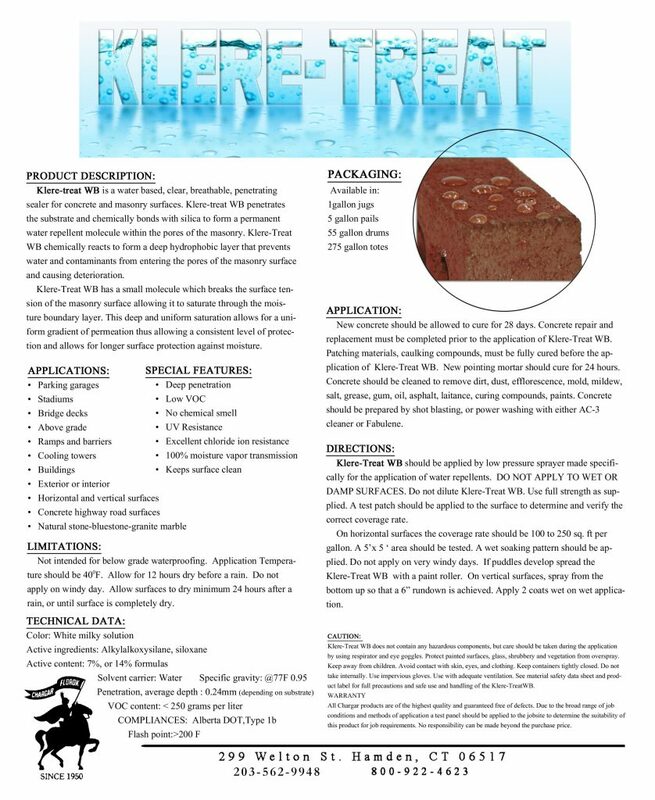 Klere-Treat WB is a masonry water repellent based on a silane and siloxane. 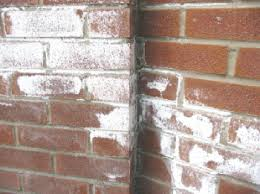 Under the influence of atmospheric humidity, it chemically reacts with and bonds to masonry, forming a highly effective poly-siloxane repellent. It is highly alkaline resistant and designed for use on brick, concrete block, precast concrete, stucco, limestone, fieldstone and many other natural stones. Kleare-Treat WB provides superior protection against moisture penetration, thereby preventing the deleterious effects of efflorescence. The deep penetrating application retains it’s natural appearance with no surface build up or darkening effects. 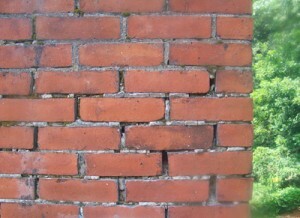 The masonry remains completely breathable. Klere-Treat WB can also be applied to parking garages and flat concrete or masonry surfaces to reduce attack from deicing salts. 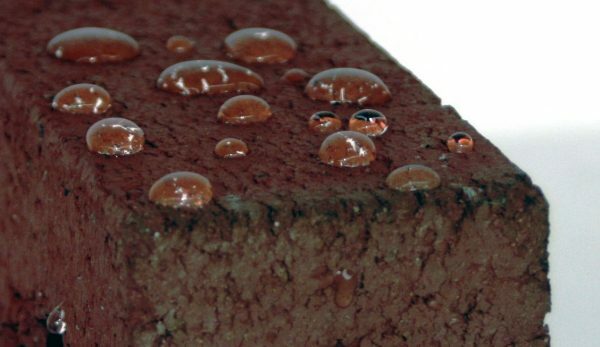 Unlike many water repellents Klere-Treat WB does not break down due to alkali in masonry. A premium grade, water based masonry water repellent based on a silane and siloxane blend. 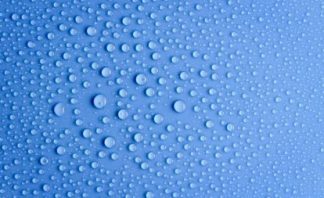 Enviro-Shield 40WB is a water based, VOC compliant, high performance, clear, penetrating water repellent sealer. It is designed to provide long term protection for brick, blocks, Jersey barriers, vertical or horizontal concrete and natural stones and other porous surfaces. Enviro-Shield 40WB repels water on masonry surfaces for up to 10 years and can be sprayed with a low pressure sprayer, allowing it to thoroughly soak the surface up 1/2″ deep. Enviro-Shield is easy to use. Overspray can be washed off with soap and water. Sprayers and tools can be washed with soap and water. 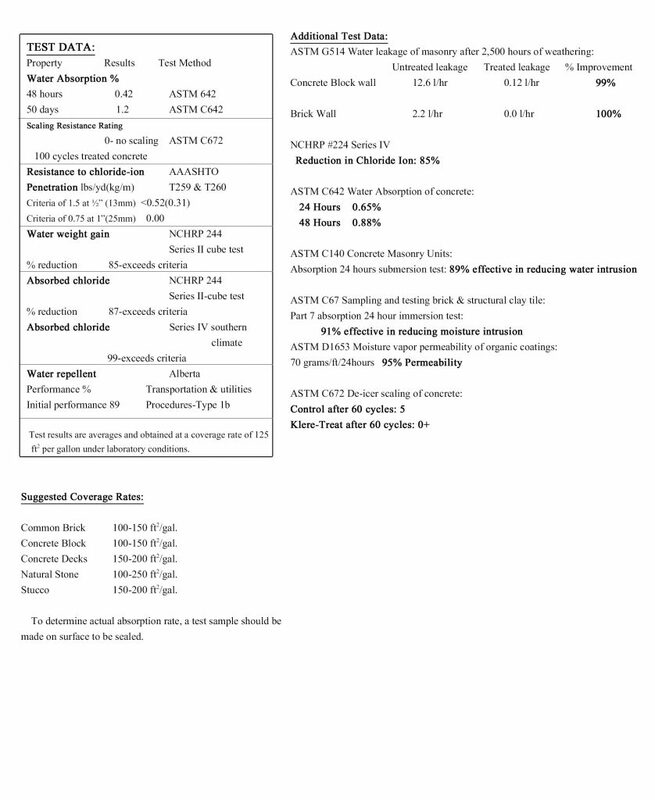 Enviro-shield is available in formulas of 20% solids and 40% solids. 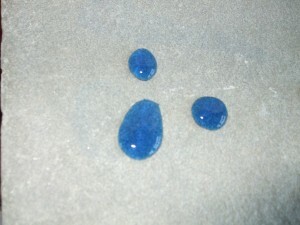 Enviro-shield is an excellent cold weather water repellent since it will not freeze.